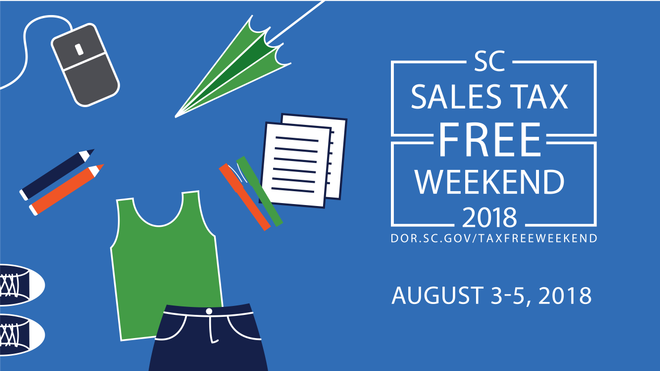 With back to school just around the corner, South Carolina is rolling out once again its tax-free weekend. Each year at 12:01 a.m. on the first Friday of August, the state waives its 6 percent sales tax on a wide range of selected items. There have been no major changes this year, according to S.C. Department of Revenue spokeswoman Bonnie Swingle. No new items on the list. No items taken off. Last year, tax-free weekend shoppers saved $2.2 million buying everything from ink pens to computers. And those savings extended to online purchases as well. Bed linens, including baby bumper pads, canopies, baby crib padding, bed skirts, box spring covers, dust ruffles, mattress pads, mattress toppers, pillow covers and shams. Roller skates, provided the skates are permanently attached to the boots. Note: Items such as refrigerators, toiletries, bicycles and food purchased by college students are not school supplies and not exempt from the tax. Sport clothing and uniforms, but not equipment such as mitts, helmets and pads. Towels of all types and sizes, including bath, beach, kitchen and sport towels. Paper towels are taxable. (The following are examples of devices that are not considered computers for purposes of the sales-tax holiday exemption: cellphones, smartphones or any other handheld devices that allow users to make telephone calls; handheld devices that are primarily used to download and listen to music; handheld devices that are primarily used to download and watch videos; and devices that are primarily used to download and read books (e-books). However, portable devices that have computing and media functions, allow users to access the internet and have a multitude of software applications (or the capability to download a multitude of software applications) are considered computers for purposes of the sales-tax holiday exemption, provided such devices do not allow users to make telephone calls. Note: The sale of a computer monitor, keyboard or scanner by itself would not be exempt during the sales-tax holiday. If a monitor, keyboard or scanner is purchased as part of a package that included the computer processing unit, then that is one transaction to purchase a computer and the sale of the packaged unit (CPU, monitor, keyboard, scanner) is exempt. The sale of a digital music player, digital camera, cellphone or a smartphone, whether or not purchased in conjunction with a computer processing unit (CPU), is not exempt during the sales tax holiday.